Matthew Dickerson, Thanksgiving 2018. As you might guess from the title, this essay is not about trout or rivers. Indeed, though J.R.R.Tolkien’s Middle-earth stories occasionally mention fish or fishing–mostly in scenes involving Smeagol, a.k.a. Gollum –Hobbits in general are not especially fond of boats, nor of rivers (except to gaze at as part of a pastoral landscape). And yet… there are vitally important ties connecting what and how we eat with ecology; connecting agricultural practices and how we treat the soil with rivers and how we treat water. And (as this essay suggests) our attitude of thankfulness (or lack thereof) therefore also has great implications. I published this essay nearly a decade ago in a forum for Tolkien’s scholars. It is no longer available at that now-defunct site. In honor of Thanksgiving, and of its important (though implicit and unstated) relationship to rivers (and to the creatures that live in them), I republish it here. 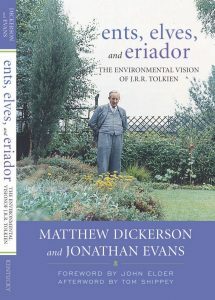 note: Those interested in more of my writings about J.R.R.Tolkien–especially environmental aspects of his writing–may be interested in my book co-authored with Jonathan Evans titled Ents, Elves, and Eriador: the Environmental Vision of J.R.R.Tolkien, published by the University Press of Kentucky, 2006. “When we say grace, we acknowledge our membership in creation and testify to the conviction that, as eaters, we are responsible for what we eat, how we eat it, and who we eat with.”– Norman Wirzba. In April of 2009, Norman Wirzba gave a lecture at Middlebury College in Vermont (USA) titled “Saying Grace: Food and the Life of Faith”. [Check out Wirzba’s book Food and Faith: a Theology of Eating.] As the title suggests, Wirzba’s talk was about the importance not only of eating and of what and how we eat (our food), but also about thankfulness in general and in particular about the act of “saying grace” (giving thanks) before a meal. His talk explored how the act of saying grace can transform, in a healthy and positive way, our approach to eating and to food. In many ways—though as we shall see, not in all ways—the Hobbit culture of the Shire, and especially the Hobbits’ approach to eating, is presented by Tolkien as a model of healthy society. The Shire and the ways and lives of Hobbits is something that the wise of Middle-earth, including Aragorn and Gandalf, and later Frodo himself, believe is worth great sacrifice in order to save. 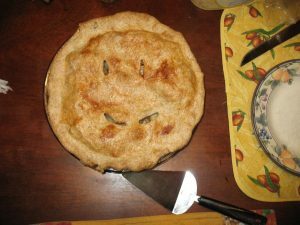 However Tolkien also presents a major flaw which threatens to undermine healthy attitudes toward food and eating: the Hobbits have largely forgotten the practice of “saying grace”—that is, of expressing thankfulness—before their meals. Tolkien’s narrative suggests that this failure undermines what in most other ways is something toward which we ought to aspire. It is apparent to even the most casual reader of The Hobbit and The Lord of the Rings that food is important to Hobbits. We all remember that Hobbits are fond of six meals a day including two dinners, if they can get it. As the Prologue to The Lord of the Rings points out, they “eat, and drink, often and heartily.” Indeed, “growing food and eating it occupied most of their time” (LotR, Prologue). So obviously important are food and eating to Hobbits, in fact, that beyond an occasional casual reference to the fact, few scholars and critics even bother to carefully explore the importance of food in Tolkien’s narratives. Even in Ents, Elves and Eriador: the Environmental Vision of J.R.R.Tolkien (University Press of Kentucky, 2006), which I co-authored with Jonathan Evans, while we do explore some of the eating scenes in Tolkien’s Legendarium, especially in Chapter 3 of our book, the emphasis of that exploration is more on agrarian aspects of Tolkien’s writing than on the act of eating itself. That is, we explore the eating of food mostly in the context of the growing of food.) It is therefore worth a few minutes (or paragraphs, as it were) to remind ourselves just how important food and eating are, not only to Hobbits as beings, but to Tolkien’s narrative. Indeed, though The Lord of the Rings is popularly known as adventurous fantasy, and many fans—especially those who are more familiar with the story through Peter Jackson’s films than through the books themselves—may think more of the great fights and battles as the central aspect of the works, it would not be an unjustifiable claim that eating provides a more central role in the narrative than fighting; food is more important than battles. Frank Weinreich has done a recent study of the violent content in The Lord of the Rings. He notes that of approximately a half million words in the text, “non-violent content makes up 68% of the narrative.” Thus less than one third of the text is in any way about battles, wars, or fighting. In fact, of the remaining 32% percent of the narrative, much of that is not explicitly violent, but is labelled “in-between”, meaning that while it does not explicitly describe battles or violence, there might be a dialogue in which some violent content is suggested. In fact, only 20% of the text has any violent content, and most importantly only 8.2% of the text involves “actual violence”—descriptions of fights and battles. Weinreich further divides “non-violent” content in several sub-categories. As he points out, “the descriptive part of the narrative consists mainly of the depiction of travel (18.7% of the whole corpus) and the portrayal of people and customs”, which accounts for 7.7%. Thus more than three as much narrative space is given to travel (which often includes meals, explicitly described, such as the rabbit cooked by Sam in Ithilien) and the portrayals of people and customs (a large part of which relates directly to food: to raising of food, or to meals, eating, and drinking) than is given to any direct battles and warfare. And this study did not include the Foreword or Prologue which are even more predominantly given to describing culture (and food) in the Shire. Consider again some of the important and memorable meals eaten by Frodo, Sam, Merry, and Pippin (or some smaller group of these four) in The Lord of the Rings. Of course the story begins (as did The Hobbit) with a party: a great communal feast that takes up nearly a chapter to describe. The details include many of the foods and beverages consumed, and who is there to share in it. Proceeding from there, we have Frodo’s meal with Gildor and the delightful dinner with Farmer Maggot. In both cases, the fare and setting are described in some detail: “bread, surpassing the savour of a fair white loaf to one who is starving; and fruit sweet as wildberries and richer than the tended fruits of gardens” with the Elves (I/iii), and with the Maggot family “beer in plenty, and a might dish of mushrooms and bacon, besides much other solid farmhouse fare” (I/iv). There is a drink (and presumably a meal) they thought about, but never got, at The Golden Perch (I/iv) and the meal at Crickhollow (I/v). There are meals in the house of Tom Bombadil, two of which are mentioned specifically: “yellow cream and honey-come, and white bread, and butter; milk, cheese, and green herbs and ripe berries gathered” for their first supper, and for breakfast the next morning something we assume was equally good, for which the four hobbits “left the table late and only when it was beginning to look rather empty” (I/vii). And this brings us only to the end of Book I. During this time, there is only one battle: the fight at Weathertop. Of course the danger grows, and we have more battles large and small after the four hobbits depart from Rivendell. But at Rivendell and afterward, the four hobbits also have many meals that are described as well—again at times with a surprising amount of detail that might be seen as unnecessary to the story, and yet that often surpasses t he level of detail used to describe the battles. It would be rather tedious to elucidate them all, but at least a few are worth mentioning as they are significant events at many levels: the Fellowship’s parting feast with Galadriel (II/viii), the “meal” of Ent draught that Merry and Pippin have at the house of Treebeard (III/iv), the reunion meal in Isengard (III/ix), the dinner that Frodo and Sam eat with Faramir in Ithilien (IV/v), Pippin’s meal with Denethor (V/i) and Merry’s meal with King Théoden in Rohan (V/iii). And these are but a few, and do not include the importance of Lembas, which could fill an entire book (and, indeed, has received considerable scholarly treatment). So food and eating, meals and drink, play an important role in Tolkien’s narrative, especially when and where Hobbits are concerned. But again, this was likely an obvious point to most readers. It is admittedly debatable whether food is more important to the narrative than fighting, but the idea that it might be is certainly not as far-fetched as it would seem to those who think only of the typical writing in the genre of heroic fantasy, or who are familiar with Tolkien only through Peter Jackson’s eyes. One could take either side of this debate—and perhaps some will, after reading this piece. Yet the fact that food is anywhere near as prevalent as “violent themes” in Tolkien’s narrative is itself noteworthy. But what does Tolkien do with so many scenes involving eating? That is, what do we learn from these scenes about the cultures and values of Middle-earth and especially the Shire? I would suggest that the answer is threefold. The frequent meal scenes tell us: first that food and habits of eating are important aspects of a healthy community of Hobbits in the Shire (very much in keeping with the ideas of Norman Wirzba with which I began this paper); second, that meals involving Hobbits are important aspects of hospitality, and in particular of breaking down barriers and building community with strangers—that is, so that Hobbits can have positive relationships with members of other races, or perhaps just with Hobbits from outside the Shire; and third that the way the Hobbits approach eating is also an important part of the ecological health of the Shire. Regarding the first point, perhaps it can be made most simply with a single observation: the people of the Shire are fond of eating together, and there are no wars within the Shire. That is, the fact that Hobbits are “slow to quarrel” and do not kill anything for sport, and that “growing food and eating it occupied most of their time” (LotR, Prologue) are not coincidental and are not intended by Tolkien to be coincidental. Hobbits wonderfully illustrate Wirzba’s point: “eating is among the most intimate ways we know for joining our lives with others—other people, animals, plants, local habitats, and ecosystem processes.” This can be seen not only in extended family meal scenes such as in the homes of the Maggot and Cotton farming families near the start and end of The Lord of the Rings, but also in the much larger communal feasts like Bilbo’s birthday party, and in the popularity of inns and taverns in the Shire. The close bond that exists, and continues to develop, between Frodo, Sam, Merry, and Pippin almost certainly owes a great debt to time spent together over food and drink. And Tolkien’s narrative does not skimp in describing several of these scenes. But the importance of meals to community does not pertain only among or within Hobbits of the Shire. We also see the eating meals together literally helps join the lives of Hobbits together with the lives of strangers, and even with those for whom Hobbits would have a natural distrust (which, as we learn, includes almost everybody outside their own little corners of the Shire). The most poignant example in The Hobbit may be the meal served by Beorn to Bilbo and his fellow travelers. In The Lord of the Rings, the narrative is full of examples. A long period of fear and distrust between Frodo and Farmer Maggot is broken by a wonderful meal together, where one Hobbit, Farmer Maggot—though he has reason to be fearful of the general situation, having just encountered a Black Rider, and he also has reason to distrust Frodo based on the young Baggins’ old habit of stealing mushrooms—makes a choice to show hospitality in the form of a shared meal. Frodo’s response to the farmer and his hospitality, though spoken before the meal was actually served, tells the tale. Several examples of meals mentioned in the previous section also show a joining of lives, even among diverse strangers. That is to say, they show how somewhat reclusive and provincial Hobbits find their lives joined to those in the world outside the Shire, even members of other races: the Elves in Gildor’s company, Elves of Rivendell and Lothlórien, Fangorn and the Ents, and Faramir and the men of Gondor. In the latter two cases especially, the meeting of two hobbits with these strangers begins with fear and distrust on both parts. And in both cases, a meal is shared among strangers, and the distrust begins to fade. By the end, close bonds of friendship have been forged. Wirzba also mentions food and eating as means toward the joining of lives with “animals, plants, local habitats, and ecosystem processes.” That is, healthy eating habits—as has been well documented in the world over the past decade or so—are vitally important to a healthy ecology. This aspect of food and eating I have explored more thoroughly with Jonathan Evans in our book Ents, Elves and Eriador: the Environmental Vision of J.R.R.Tolkien. It is the connection between eating and farming in a healthy agrarian society. Hobbits are committed not only to communal aspects of eating, but also to eating locally. Here I will quote from that earlier work. At once respectful of the inherent dignity of the natural environment and respectful also of the dignity of those who work the soil, in the Hobbits of the Shire, Tolkien depicts a people in harmony with the creation of which they are a noble part. Their local and regional economy is based upon an agrarian system dependent upon sustainable agriculture; they extract from the soil only such bounty as the harvests can provide, affording them not only subsistence but also the comforts resulting from abundance. The Shire represents an idyllic agrarian, pre-industrial society where people can live comfortably at home in the natural world. It has romantic elements, but it is also much more. It is an agrarian ideal in the good sense: a picture that can inspire readers toward appropriate steps that ih some small way can introduce the best elements of the Shire into the real world. Now so far we have focused on positive aspects of Hobbit eating habits and customs, and of Tolkien’s depiction of what and how we eat in his work The Lord of the Rings. One thing we have not touched on, however, is the notion of “saying grace”, or of being thankful, but that, in fact, was the central part of Norman Wirzba’s presentation. Let me return for a moment and cite Wirzba in greater length where he ties together to act of eating with saying grace. Saying grace occurs at mealtimes because eating is among the most intimate ways we know for joining our lives with others—other people, animals, plants, local habitats, and ecosystem processes—and with God as the source of life. Here we encounter and take in life’s gratuity and fragility, its beauty and costliness. Opposed to the whirl and speed of postmodern life, saying grace is the patient and focused time in which we become mindful of our place in the world. Eating is not simply a physical act. It is also a spiritual practice whereby the deep and sacramental significance of life is daily learned. This sacramental understanding forms the basis for an ethic that promotes the health and well-being of people and creation together. When we say grace, we acknowledge our membership in creation and testify to the conviction that, as eaters, we are responsible for what we eat, how we eat it, and who we eat with. For all the good that we can find in the Hobbit model, it has one significant shortcoming, and Tolkien suggests as much to his readers: Hobbits have forgotten to be thankful. Or, at the very least, they have ceased to express their thanks. Tolkien’s narrative not only points this out, but seems to suggest (though, as is usually the case in Tolkien’s fiction, without didacticism) that at least some of the problems in the Shire may be attributed to a failure both of being thankful and of expressing a proper thankfulness. That the Hobbits do not take a “patient and focused time” to say grace and to “be mindful of [their] place in the world” is evident in more than a mere omission of that detail. After all, the saying of grace is in most traditions a religious act, and Tolkien was wary of the inclusion of explicit religion in his Legendarium—at least religion in the form it is known in our modern world. In one oft-cited letter, he writes, “The Lord of the Rings is of course a fundamentally religious and Catholic work; unconsciously so at first, but consciously so in the revision. That is why I have not put in, or have cut out, practically all references to anything like ‘religion’, to cults or practices, in the imaginary world. For the religious element is absorbed into the story and the symbolism.” (Letters, p.172) So even if the Hobbits, as part of their culture or beliefs, expressed thanks to a divine being before a meal, and even if Tolkien imagined them as doing so, it might be surprising if he included that detail in his narrative—despite the numerous meals which are described with plenty of other detail including the setting, the menu, those present, and other aspects of the conversation. In fact, however, we are explicitly told that Hobbits do not have any such practice of saying grace. We are told this through the surprising example—surprising, that is, in light of Tolkien’s comment above—of another wise figure who does pause to give thanks. The wise figure is Faramir, and the scene is the meal he eats with Sam and Frodo. It is difficult to mistake Faramir’s act as anything other than a prayer: a deliberate act to pause for “a moment of silence”, akin to Wirzba’s “patient and focused time in which we become mindful of our place in the world.” (As I noted in my earlier book Following Gandalf, “Even if one has not read The Silmarillion, and does not recognize ‘that which is beyond Elvenhome and will ever be’ as Eru Ilúvatar, the Creator, it is still hard not to understand this action as a sort of prayer.” ) The three part formula of Faramir’s language—his speech of that which “was”, which “is”, and which “will ever be”—is certainly strongly reminiscent of the Gloria Patri prayer in Tolkien’s Christian and Catholic tradition. This prayer (in the King James Version) ends: “As it was in the beginning, is now and ever shall be, world without end. Amen” [emphasis added]. So Faramir pauses to pray, or to “say grace” as it were. And despite Tolkien’s avowed effort to remove explicit references to “anything like ‘religion’” from his tale, this remains in the narrative. It would seem, then, to be important. Not merely important, but this saying of grace is shown to be a model of what wisdom is! In short, Hobbits took what they had for granted, and ceased to be thankful. The term “sheltered” is certainly deprecatory here, as is the comment that they “ceased to remember it”—meaning, they ceased to appreciate and be thankful for it. Certainly they had much to be thankful for. “The land was rich and kindly, and though it had long been deserted when they entered it, it had before been well tilled.” Yet they ceased to be thankful for the land itself, or for those—like Gandalf, Aragorn, and the Rangers—who worked so hard to protect (or shelter) them and their life of peace. As a result, the Hobbits have become provincial, distrustful of outsiders, and ultimately have forgotten their place in the world—indeed, many of them have essentially forgotten about the world outside the Shire altogether. In some sense, then, we might say that they have forgotten their “membership in creation”. And so their community is not what it ought to be; it is insular and marked by distrust of outsiders. Taking their land for granted, and failing to be thankful, also seems to be the very thing that makes them so vulnerable to having it all taken away from them at the end by Saruman and his minions. In failing to be thankful, they are assuming the land and all its goodness, in particular its abundant food, is theirs by right—“the right of all sensible folk” (and they certainly see themselves as sensible). Thus they are incapable of imagining that it might be taken away. Is Tolkien suggesting in these passages—in the Prologue, the meal with Faramir, and in the chapter “The Scouring of the Shire”—that Hobbits need to learn to be more thankful? The answer, I think, is an unqualified “yes”. It takes characters such as Frodo, Sam, Merry, and Pippin who leave the Shire—who experience what it is to go without meals, who must depend for their meals at times on the hospitality of others like Galadriel, Faramir, and Treebeard, and who learn from the thankfulness of models such as Faramir —and then return and re-teach their fellow Hobbits an ethic of thankfulness. And in so doing, they again transform the Shire. Frodo and Sam especially seem to understand that they have received a precious and costly gift. They can echo the words of Norman Wirzba with which I end this brief exploration into eating and thankfulness. When we say grace, we do not merely say a few words over our food. Rather, we are transformed so that our eating of life is also a sympathetic participation in the ways of life. Thanksgiving becomes the means through which we elevate and hold before each other the sanctity and grace of the world. In our thanksgiving, we acknowledge what we receive as a precious and costly gift that is to be cherished, protected, and celebrated. The Shire—its land, its culture, its people; its soils and rivers and woods—is just that: a precious and costly gift to be cherished, protected, and celebrated. By the end of The Lord of the Rings, at least four Hobbits seem to understand that. They enjoy eating as much or more than ever. And they are thankful. An essay version of this talk was later published in the Journal for the Study of Religion, Nature, and Culture 3:2 (2009) with the title “Saying Grace: Transforming People, Transforming the World”. Quotations are taken from the published essay version. Norman Wirzba is Research Professor of Theology, Ecology, and Rural Life at Duke University Divinity School. Frank Weinreich, “Violence, Conflict and War in Tolkien”, presented at the 6th Seminar of the German Tolkien Society, University of Hanover, April 25-26, 2009. “Violence in the Lord of the Rings”. Matthew Dickerson and Jonathan Evans, Ents, Elves, and Eriador: the Environmental Vision of J.R.R.Tolkien (Lexington, KY: University Press of Kentucky, 2006), p.92. Matthew Dickerson, Following Gandalf: Epic Battles and Moral Victory in The Lord of the Rings (Grand Rapids: Brazos Press, 2003) p.58.